Exhibition Centre at The Forum Exhibition CentreThe Forum in Norwich is a stunning community building in the city centre and is the ideal place to meet any time of the year. There's an al fresco café and a pizzeria in a very unique setting plus an outdoor amphitheatre over looking the magnificent St Peter Mancroft church. The Forum was an especially commissioned £65 million project for the East of England to celebrate the new millennium. Designed by Sir Michael Hopkins, who has designed a number of other award-winning buildings including Norwich Cathedral Refectory (2004). The Forum attracts approximately two million visitors per year and houses the Norfolk and Norwich Millennium and the 2nd Air Division Memorial Libraries, BBC East's regional headquarter, Norwich Tourist Information Centre, a shop, a cafe, restaurant, Fusion - a giant digital gallery (the largest in Europe), BBC open studio and The Curve auditorium. 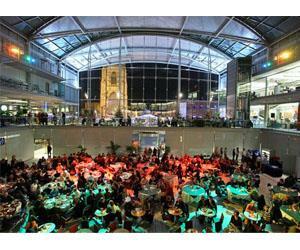 The Forum in Norwich is a stunning community building in the city centre and is the ideal place to meet any time of the year. There's an al fresco café and a pizzeria in a very unique setting plus an outdoor amphitheatre over looking the magnificent St Peter Mancroft church. Throughout the year an exciting and varied programme of events are staged, including outdoor cinema and opera, Comedy Store, jazz concerts, art exhibitions, craft markets and children’s school holiday activities. It's well worth checking the website, www.theforumnorwich.co.uk, telephoning the 24 hour information line on 01603 727905 or popping in to see what's going on.